Recently completed, this luxury self-catering accommodation is aimed at couples seeking a secluded hideaway and/or a base from which to explore the surrounding countryside, itself designated an ‘Area of Outstanding Natural Beauty’. Lying in a small valley overlooked by open hillside fields and woodland copses. Here you can totally immerse yourselves in this remote location and still enjoy the comforts of modern day living. Here in the Upper Clun Valley there is little or no through traffic and the wildlife remains relatively undisturbed. With some forethought, the chances of spotting nervous creatures such as Fallow and Roe deer are much higher than the average, particularly around the nearby Blakeridge Wood. You’ll see all the birds that you might expect and others, such as the Curlew, which are becoming a rare sight. Buzzards are a common sight in the skies and roadside trees and mixed flocks of Redpolls and Linnets are often seen around the farmlands in late autumn and winter. With no street lighting for miles around, on a moonless night you’ll struggle to see your hand in front of your face. All our external lighting is PIR activated and on short timings to keep lighting levels to an absolute minimum. This level of darkness means that on cloudless nights there is a really great opportunity to do some stargazing. If you would like the opportunity to scan the heavens we will be pleased to set up our computerised telescope for you to use. Even the seemingly never ending daily hard work of sheep farming is largely offset by the peace and tranquility of the scenery. Offa’s Pitch sits on it’s own in a small paddock of about an acre with a stream at the southern boundary. Here you can totally immerse yourselves in this remote location and still have all of the comforts of modern day living. Guests are invited to stay at Offa’s Pitch for a minimum of two nights from £150 per night. Our Scandinavian Hot Tub is £50 a weekend. For details on how to make a reservation click BOOK NOW. Offa’s Pitch rests on a sea of grass completely surrounded by a horizon of hills and ancient woodlands which overlook lush green valleys of pastureland cleft by small brooks. Even the seemingly never-ending daily hard work of sheep farming is largely offset by the peace and tranquility of the scenery. Since Roman Britain, this part of Shropshire has been referred to as the ‘remotest part of England’. Offa’s Pitch is in one of many similar enclosures that are divided by hedgerows in this secluded part of the beautiful Clun Valley. Here there are many trails to walk and routes to cycle. 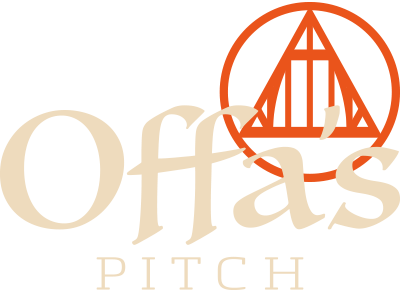 Offa’s Pitch is only 200m from Offa’s Dyke path, 10 mins walk from the ‘Shropshire Way’ and the ‘Kerry Ridgeway’ too is only a short distance. Nearby Bishops Castle forms a part of the ‘National Cycle Route’. Offa’s Pitch sits on the historical border with Wales, the existing border is now about 6 miles away.